I have downed many a sandwich in my day. When it comes to food conveyances, the sandwich is perhaps the most ingenious design in its simplicity. Examples of the sandwich go all the way back to ancient Jewish sage Hillel the Elder, who supposedly consumed meats sandwiched between pieces of matzos. People of the middle ages ate their food off of thick slabs of bread called “trenchers” which after the meal was finished would be given to the dog or a beggar: the precursor of the modern open-face sandwich. Though probably the most famous sandwich origin story is attributed to John Montagu, the Fourth Earl of Sandwich. It was said that he was an avid gambler and card player and couldn’t be bothered to leave the betting table in order to have a proper meal. So, he had servants bring him slices of meat between slices of bread in order to keep his hands clean while he played cards, though this is just a legend. One could say that we owe the very cornerstone of modern society to the sandwich. It’s the people’s food and everyone and their mother enjoys sandwiches from the hard working factory-laborer to the leaders of the world. But there have been some sandwiches that stick out as the greatest. For some reason, their unique pairings of flavors come together to make not just a food, but cultural icons. Not counting hamburgers or hotdogs (can you even really call those sandwiches? ), these are MySweetRhodora’s Top 10 Sandwiches. Bacon, lettuce and tomato were one of the greatest things to happen to sliced bread since, well, sliced bread! Usually served on toasted bread along with a helping of mayonnaise, people know what you’re talking about when all you say is “BLT.” Personally, I find that adding avocado enhances the flavor and if you have the time, try frying the bacon in balsamic vinegar. It’s delicious. Most of us Stateside don’t know what in the world a chip butty is. In fact, I’ve been hard-pressed to find a place that serves this sandwich anywhere in the States. I’ve only been able to get my hands on one while visiting my cousins in the UK, and I always remember to get one while I’m there. If you don’t know about it, a chip butty consists of two slices of buttered white bread around a healthy (well not exactly “healthy”) portion of chips (the big french fry kind, not Lay’s). When I first heard of it I thought it sounded gross, but I’ll be damned if it wasn’t one of the tastiest things I’ve ever eaten! Top off with some ketchup for junk food heaven. Hey, at least it’s vegetarian right? This one came out of left field didn’t it? The pan-bagnat (pronounced pahn-bahn-yah, the “t” is almost silent) is a specialty of the people around the region of Nice, France. The flavors come together perfectly in this sandwich: take a hollowed out baguette and fill with tuna (if you’re using canned please use the kind packed in oil), green bell pepper slices, red onion, sliced hard boiled eggs, olives (kalamata variety please), tomato and top with a vinaigrette made from red wine vinegar, dijon mustard, salt and pepper (there’s tons of good recipes for this out there). It sounds strange at first but it’s really one of the best picnic sandwiches out there. It’s so popular that those crazy French have an association to promote and protect the pan-bagnat. Take a special lady out for a picnic and impress her with your culinary skills. I swear she’ll think you actually know what you’re doing. I really can’t get enough of these things. Thought to have originated as a favorite of Cuban workers in either Cuba or immigrant communities in Florida, the Cuban sandwich is becoming more and more popular every day. 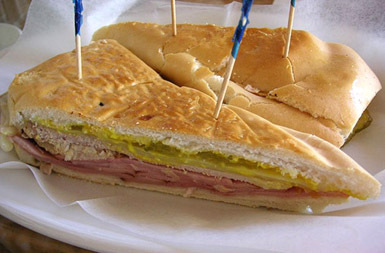 A variation of the classic ham and cheese, the sandwich is made with ham, roasted pork (mmmmm), Swiss cheese, pickles and mustard between two pieces of Cuban bread. If you’re making these at home and can’t get your hands on Cuban bread, hoagie rolls are a fine substitute. The key to a good Cuban is the pressing. The sandwich is always pressed, making the bread thin and crisp. If you don’t have a sandwich press at home, I’ve heard of some people buttering the outside of the bread and cooking it in a pan and pressing it down with another, heavier pot or pan. Personally, I think it works best by taking two bricks wrapped in tin foil (preheated in the oven) and putting those down on top of the sandwiches to press them. Works like a charm! Mmmmm. That picture alone makes my mouth water. The Reuben has been typical deli fare and many different “Reubens” lay claim to having invented it. I tend to side with the sandwich's origins being the no longer existing Reuben’s Delicatessen in New York City where the sandwich was supposedly invented in 1914. One of the biggest sandwiches around, a typical Reuben consists of a big helping of quality corned beef (none of that canned junk), sauerkraut, our friend Swiss cheese, either Russian or Thousand-Island dressing between slices of rye or pumpernickel. Some delicious variations on the Reuben substitute hot pastrami for corned beef to make a sandwich some call “The Rachel.” Hot pastrami on rye was one of my favorites I couldn’t fit on the list, mostly because it’s too similar to the Reuben. This beast is definitely not meant to be eaten on the go, and there’s nothing like sitting down at your local deli and partaking in a delicious Reuben. 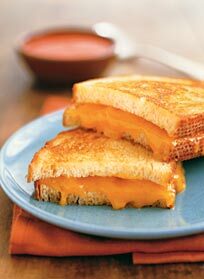 What can be simpler and more comforting than a grilled cheese sandwich your mom made? Warm and delicious, the grilled cheese sandwich is unpretentious, honest food at its finest. I remember my roommates and I making grilled cheese with our irons. That’s how comforting it is. Pair up with a bowl of hot tomato soup and get yourself out of the cold. Definitely one of the more labor intensive sandwiches on this list, you’re efforts will be rewarded if you make yourself a nice pulled pork sandwich. A pork shoulder is slow barbecued for hours on end until it’s so tender that it’s pretty much falling apart. 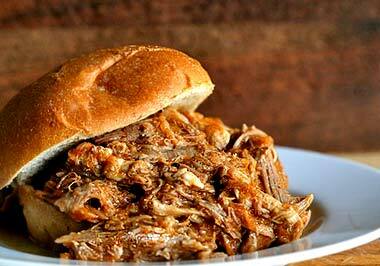 The sandwich gets its name from the process of using a fork to pull the pork apart into thinner strips. Piled high on a hamburger bun and topped with your favorite barbecue sauce (or no sauce if you’re a dry meat kinda person) with coleslaw on the side, this is the perfect sandwich for big cookouts, as that pork shoulder will make a lot of sandwiches. People from Philadelphia take their sandwiches seriously, and this is definitely their weapon of choice. It is more than just a sandwich to these people, it’s a way of life. Being from Jersey, I didn’t really understand how important this sandwich was until I was in Philadelphia visiting a high school friend of mine going to college there. It’s almost a religion there, and people proudly declare their favorite cheesesteak place like it’s their favorite NFL team. Two of the most famous locations in Philadelphia, Geno’s and Pat’s, have had a long and well publicized rivalry. Eating a cheesesteak there even has its own etiquette as former presidential candidate John Kerry found out when he was made fun of in the Philadelphia Daily News for, dear God, ordering his cheesesteak with Swiss cheese on it *gasp*. Everyone knows nothing melts over steak better than Cheese-Whiz! This sandwich needs no introduction. 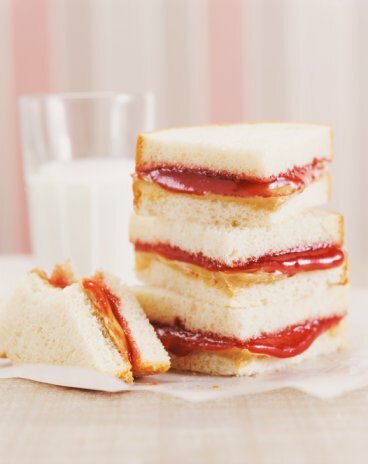 Not only one of the greatest sandwiches, but one of the greatest food pairings in history, I think you’d be hard-pressed to find a person who hasn’t eaten and enjoyed a good peanut butter and jelly sandwich. This sandwich is definitely the most versatile as one can use any sort of bread, jelly or substitute for peanut butter. I’ve had it with nutella (a hazlenut spread), mashmallow fluff, dried fruit, bananas (my favorite), pickles (it’s not gross), and even once with vegemite. It’s damn near impossible to mess this sandwich up because that’s just how good it is. The peanut butter and jelly sandwich is so popular that, like the Philly cheesesteak, it’s not just a sandwich but a cultural icon. Everybody knows what you’re talking about when you say you’re in the mood for a PBJ. Hell, I even remember Barney singing me a song about putting together peanut butter and jelly. It was the first food I was able to make on my own as I’m sure is the same with many other G1’s. And let’s not forget the infamous Peanut Butter Jelly Time song.